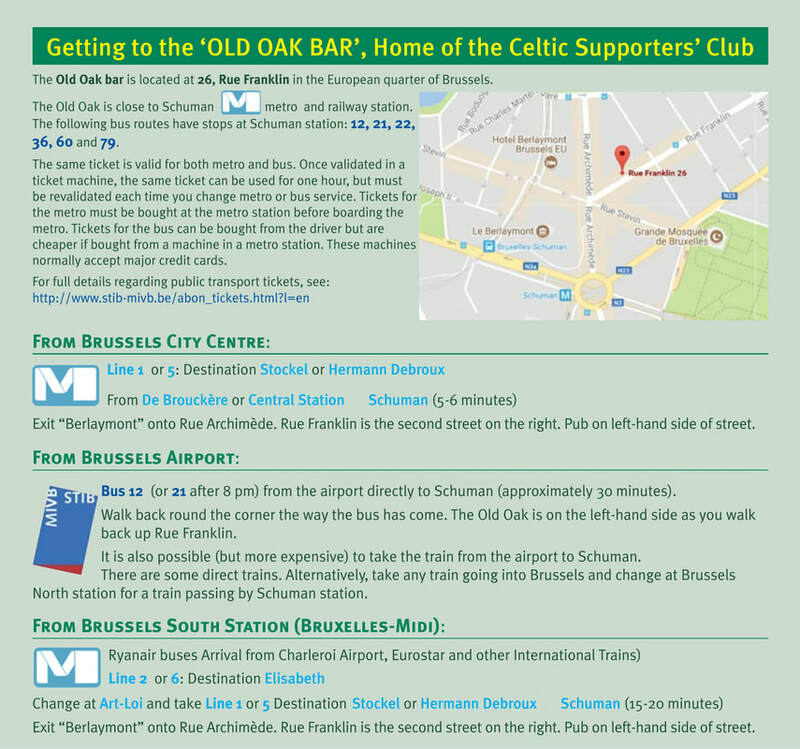 ​The Old Oak bar is located at 26, Rue Franklin in the European quarter of Brussels. The Old Oak is close to Schuman metro (underground) and railway station. The following bus routes have stops at Schuman station: 12, 21, 22, 36, 60 and 79. The same ticket is valid for both metro and bus. Once validated in a ticket machine, the same ticket can be used for one hour, but must be revalidated each time you change metro or bus service. Tickets for the metro must be bought at the metro station before boarding the metro. Tickets for the bus can be bought from the driver but are cheaper if bought from a machine in a metro station. ​These machines normally accept major credit cards. ​From Brussels City Centre, take the metro (Line 1 or 5: Destination Stockel or Hermann Debroux) from De Brouckère or Central Station metro stops directly to Schuman stop. Take the escalator at the front of the train and then the exit marked “Berlaymont”. On exiting the metro station, walk forward and round the corner onto Rue Archimède. Rue Franklin is the second street on the right and the Old Oak is on the left-hand side as you walk up the street. Schuman stop is five stops from De Brouckère and four stops from Gare Centrale. The normal journey time is 5-6 minutes. From Brussels Airport : Take Bus 12 (or 21 after 8 pm) from the airport directly to Schuman. Then walk back round the corner the way the bus has come. The Old Oak is on the left-hand side as you walk back up Rue Franklin. The normal bus journey time is approximately 30 minutes. It is also possible (but more expensive) to take the train from the airport to Schuman. There are some direct trains. Alternatively, take any train going into Brussels and change at Brussels North station for a train passing by Schuman station. From Brussels South Station (“Bruxelles-Midi” – where Ryanair buses from Charleroi Airport, Eurostar and other International Trains arrive): Take the metro Lines 2 or 6 (Destination: Elisabeth) to Arts-Loi stop and change there to Lines 1or 5 (Destination Stockel or Hermann Debroux) to Schuman stop. Take the escalator at the front of the train and then the exit marked “Berlaymont”. On exiting the metro station, walk forward and round the corner onto Rue Archimède. Rue Franklin is the second street on the right and the Old Oak is on the left-hand side as you walk up the street. The normal journey time is 15-20 minutes.